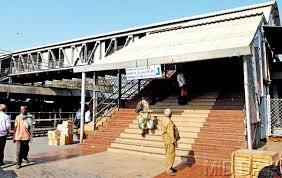 PUNE: Foot over bridge (FOB) at Pune Junction will get enough funds very soon. So that its work will resume in near future, said Member (Engineering) of Railway board, M K Gupta during his visit to Pune. He also assured to remove all hurdles in its construction. Gupta added that all kinds of road blocks, including funding, in connection with construction of the FOB will be removed. The senior official said that funds will be provided for the FOB without any further delay. Though the total cost of the project is pegged at Rs14 crore, Pune division had received only Rs 4 crore. The rest of the money had been due since last three months, resulting in the project being stalled. The official, along with those from the MahaMetro and Railway Land Development Authority, discussed ways to develop a multimodal transport system in which the metro, railways and intra-city transport would work together to find transport solutions for the city. "The planning regarding redevelopment of Shivajinagar station, which has been on the cards since 2013, was held and some important decisions have been taken in connection with the same. During the meeting, development of third line of Pune-Lonavala section and fourth line were also discussed. Discussions pertaining to re-development of Pune Station under the Swiss Challenge model, as announced by Indian Railways earlier this year, and its integration with the metro system were held," the official pointed out. Officials said that since the beginning, MahaMetro had planned integration of transport facilities at Pune station, Shivajinagar and Swargate wherein metro network will run into existing public transport utilities like railways, MSRTC and PMPML with proper integration. "Integration of both the stations with the Pune Metro project as well as remodelling of Pune Yard, were discussed," the official pointed out.